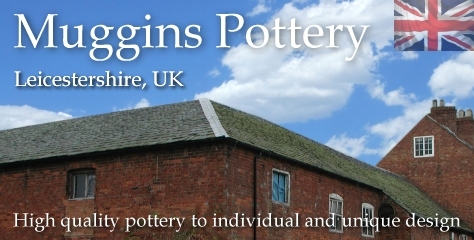 Pottery Miniature Collectables | hand-made pottery from Muggins Pottery in Leicestershire - wedding gifts, birthday presents, christening presents and anniversary gifts. Hand-made miniature hippo. This one is standing. Hand-made miniature hippo. This one is relaxing in a seated position. Hand-made miniature elephant. Buy a dozen and own your own herd. Hand-made miniature mouse. Keep it well clear of any Muggins cats. Hand-made miniature frog. Answers to the name of Lilly. Hand-made miniature pig. I got you Babe. Hand-made miniature leggy cat. This one is standing. Hand-made miniature leggy cat. This one is seated and relaxed. Hand-made miniature leggy dog. This one is standing. Keep it away from lamp posts. Hand-made miniature leggy dog. This one is seated. Hand-made miniature cat with a Cheshire Cat grin. This one is seated looking up at you. Each is different but all have a big grin. Guaranteed to make you smile! Muggins hand-made miniature shelf cat made for sitting on a shelf or bookcase. This one is lying down and relaxing but keeps an eye on what's happening below. Size is between the miniature cats and the cat money boxes. Tail can be up or down. Height is measured from ears to front toes. Hand-made miniature sleeping cat. If you have a cat, you'll recognise the pose! Sleeping on its side, eyes generally closed, and sometime with the tongue sticking out. You can't get more relaxed than this. Order arrived safely this morning - he is gorgeous, exceeded expectations. Will have difficulty handing him over to neice as it is for her birthday. Many thanks.